I received an e-mail a few days ago with a great photo of a Striped Hawk-moth Hyles livornica from Mansur Al Fahad who photographed the moths in Zulfi last summer. He recorded them four times around his house and in his moth traps and method they were common in the area. 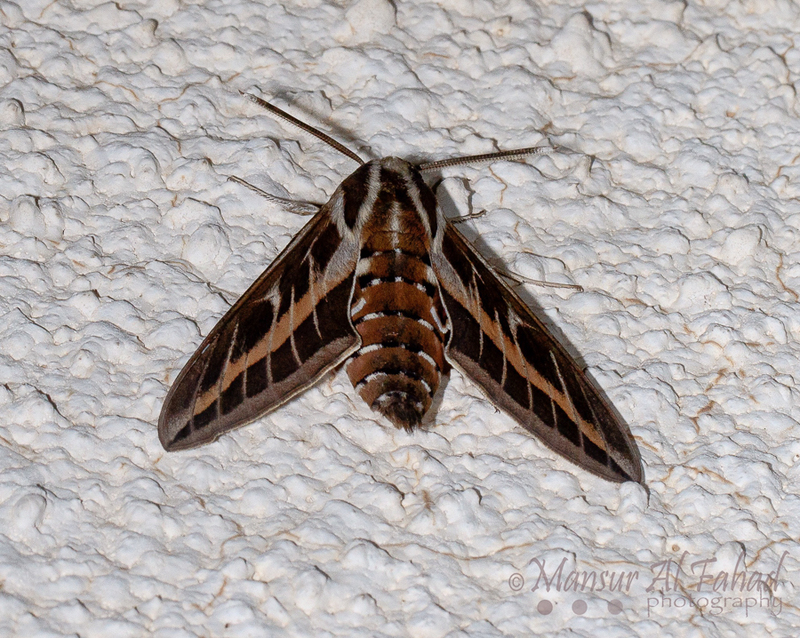 The Striped Hawk-moth is the most common Hawk-moth in Arabia, it is an insect of the open desert where it breeds on a number of different plants. It flies at night and migrates to other countries reaching as far north as Scandinavia. A successful breeding season often occurs after heavy rain with vast numbers of moths occurring. The thorax of the Striped Hawk-moth has four distinct white stripes running lengthways, and the antennae have white tips. There is a white dorsal stripe running along the abdomen and each of the underwings has a bright red patch. Mansur kindly allowed me to use his photo on my website which is shown below.